Carnoustie golfer Will Porter is "over the moon" to be crowned 2015 Scottish Boys Champion. The 17-year-old defeated Bathgate's Ross Callan 4 & 3 in the 36-hole final in Dunbar on Saturday. "It's cool to be on the winner's list with some good names," said Porter. "I've looked at what Ewen (Ferguson) and Bradley (Neil), the past two Scottish Boys winners have since achieved, and that can only give me confidence." Bearsden's Ferguson won in 2014, while Blairgowrie's Neil, who competed at the Masters in Augusta, was the 2013 champion. Past winners of the event also include Andrew Coltart and Scott Henry. "The weather reminded me of last year's British Boys at Prestwick and Dundonald, with the strong wind and no rain, really," Porter told the Scottish Golf Union. "I think I learnt from that experience and used it. 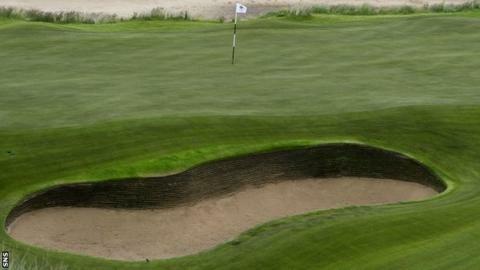 You have to make your score on the first nine at Dunbar and then hold on." Ferguson, 18, has had back to back victories in the first two big events of his Scottish amateur season; the Chanmpion of Champions event at Leven last week then winning the Craigmillar Park Open on Sunday.